Is there a way to integrate appium with selenium grid? i am executing my scripts on android devices.using windows 7 and java. How to test with multiple devices around 30 device parallel? 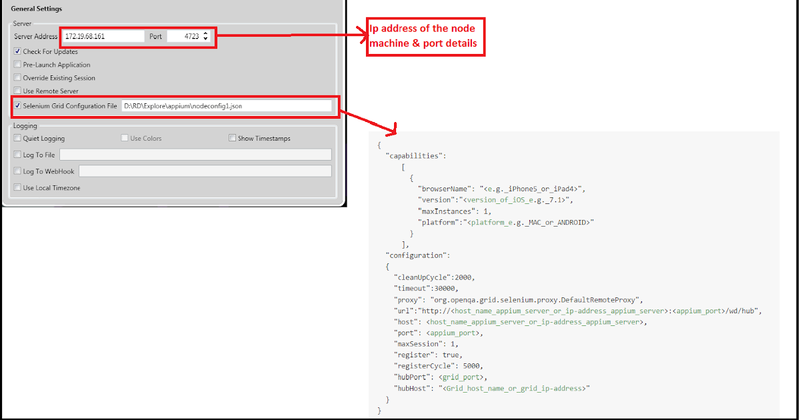 i was able to see that mobile device got registered as node to grid and the same showed up in grid console. But the problem is when i tried to execute the script it failed saying that appium could not be started at 4723. in my code i am launching the appium server and then actions are performed on the device. I think there is a problem as node is already launched at the same port as per the nodeconfig.json. Any one has any breakthrough on this? Any suggestions? Hey, I got to the same point where my node is configured with Appium server and selendroid standalone both are registered to the selenium grid. The problem is like described - both the appium and selendroid are using the same port which eventually returns an error because they are using the same port… I am still struggling to figure this out, but I will be happy if any one gots through this issue by now and can commit. I have configured appium with selenium grid and works fine. only you have to start new node for each device and register it with grid server. Let me know if I am missing something or any more configuration required? Even i was stuck on same issue for long. you might creating new driver instance for each node so iit’ll will stop existing running session when new session request open with new instance. thats why you are not able to run session parallel on both devices. Please suggest me the fix as I need to submit a POC on the same UGENTLY !!! test name="firstTest on second mobile "
I am trying to run two scripts on different mobile(Nexus and Samsung). I have 2 nodeconfig.json files each having the config of devices. I am starting 2 appium servers with different node config specified in general settings. When i check the grid console i see that both the devices are appearing as Node. In testng.xml i have specified different tests. When they are executed sequentially all the scripts are executed on a single mobile even though desired capabilities mentioned in the test script are different. Please let me know if i am missing any thing which is making the script to run on same device even though the desired capabilities mentioned are different in each test script. I have attached the test scripts and testng.xml info.txt (7.3 KB) for reference. Any help would be appriciated. hope this is helpful for appium grid setup. when only Test2 is executed, even though device id is mentioned it is getting executed on another device. And the hub will redirect your test to the properly appium server depending on “browserName”, “version” and “platform” capabilities. Has anyone successfully run test scripts parallel in two or more Android devices?